On the occasion of Earth Day, the Paris Climate agreement was signed by 175 countries. Representatives from more than 170 nations gathered at United Nations headquarters in New York to sign the Paris agreement on climate change on April 22. During the opening for signature, 175 states signed the Paris agreement on the first day and 15 states deposited instruments of ratification. “It’s a historic day. What we have adopted is not only an agreement but a new chapter of hope in the lives of seven billion people,” said Prakash Javdekar, India Union Minister of state for environment, forests and climate change. Of the 175 states which participated in the ceremony, 31 participated at the level of head of state, two participated at the level of vice president, 24 participated at the level of head of government, 9 at the level of deputy prime minister, 29 at the level of minister for foreign affairs, 59 at ministerial level, 1 at the level of former president and 20 participated at the level of permanent representative. “Each country has pledged to reduce its emissions and strengthen its resilience to potentially devastating effects of climate change. Today, around 171 countries meet here in New York to sign the Paris agreement. This is a moment of history. Never before have so many countries had signed an international agreement in one day,” said Ban Ki-moon, Secretary-General of the United Nations. “I congratulate all the countries that sign this morning and I particularly welcome the 15 parties that will also deposit their instruments of ratification, that I make a point to mention Barbados, Belize, Fiji, Grenada, Maldives, Marshall Islands, Mauritius the Islands, Nauru, Palau, the State of Palestine, the Federation of Sain Kitts and Nevis, Saint Lucia, Samoa, Somalia and Tuvalu,” he added. Ban Ki-moon also thanked actor Leonardo Di Caprio for spreading the word about climate action and Paris agreement. “This landmark pact, in conjunction with the 2030 agenda for sustainable development, holds the power to transform our world,” Ban Ki-moon added. Day-long celebrations marked the opening for signature of the agreement and countries from across the world expressed their intention to sign the agreement, to contribute to the world’s initiative for strong and decisive action to reduce greenhouse gas emissions and help nations to build a sustainable future. The events started at 8.30 in the morning with an opening ceremony in the United Nations general assembly hall. The signing ceremony took place from 9:50 am to 1 pm and along with the signatures, country representatives gave national statements. Ban Ki-moon also hosted a lunch with representatives from governments, business, civil society and the United Nations; to underline the critical importance of climate action. French President François Hollande and Colombian President Juan Manuel Santos gave opening remarks, followed by remarks from New York Mayor Bill De Blasio and former US vice-president Al Gore, among others. An event on climate implementation took place in the afternoon under the title “Taking climate action to the next level – Realising the vision of the Paris agreement”, moderated by the executive secretary of United Nations Framework Convention on Climate Change (UNFCCC), Christiana Figueres and COP21 President Segolène Royal. 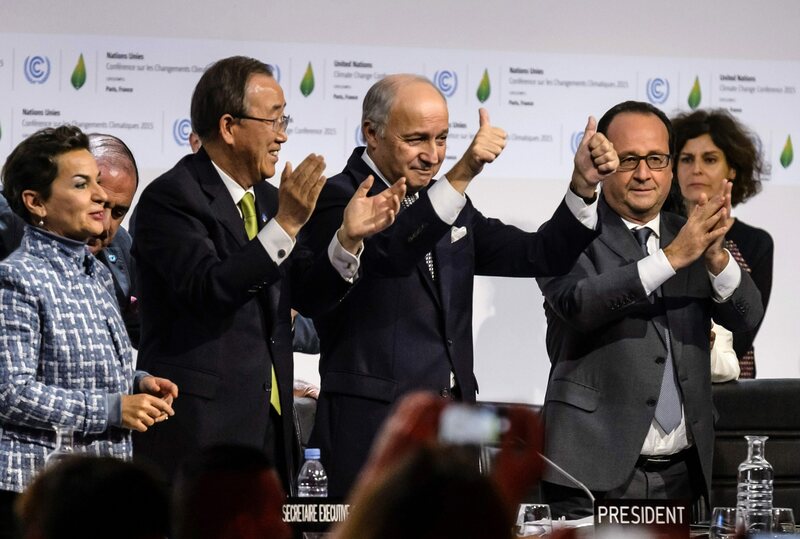 As the world took climate action, the countries moved ahead to fulfill the global goals. The sustainable development global goals include no poverty, zero hunger, good health and well being, quality education, gender equality, clean water and sanitation, affordable and clean energy, decent work and economic growth, industry, innovation and infrastructure, reduced inequalities, sustainable cities and communities, responsible consumption and production, climate action, life below water, life on land, peace, justice and strong institutions and partnerships for the goals. “Unless we are able to achieve sustainable goals, our planet itself will blow. There are list of things that need to be done to meet the needs of the society and for our planet to be healthy,” said American actor Forest Whitaker, UNESCO special envoy for peace and reconciliation.